It's All About The Journey ... Making Your Back Yard An Oasis! We are now going to take things to the other side. Here are some ideas to make your back yard a sanctuary, or and a great & casual place for people to enjoy. 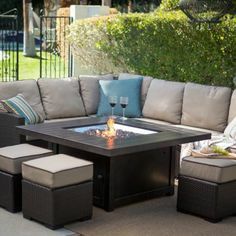 If you have a deck or a patio, some comfortable, weather resistnat furniture can transform it into an outdoor living space. Get brightly colored pillows and an outside area rug to make it have a fresh yet cozy feel. If possible invest in a small fire pit for all to sit around and enjoy. Make use of your fence by hanging flower baskets. They will naturally brighten things up. These baskets are also very easy to maintain and can last all season long. If you are having lawn troubles you can disguise them. 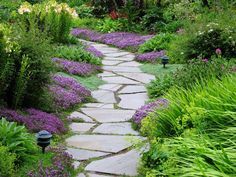 Place nice stones and make a walkway leading into your backyard, having an end point at the patio or continue to a focal point, such as a fountain or special garden. If you havenâ€™t already installed a waterfall, it might be worth some thought. It will not only make you backyard feel like and oasis, but also give it that modern Asian feel. Itâ€™s calming and really ties everything together. Who doesn't love a Gazebo. They're great retreat for relaxing or an intimate spot to entertain friends with some wine and hors d'oevres.